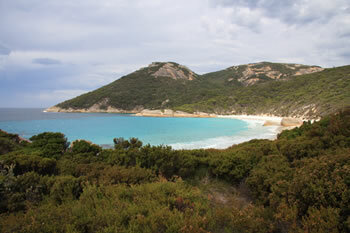 Little Beach is a beautiful white beach in the Two Peoples Bay Nature Reserve, 35 kilometres east of Albany. 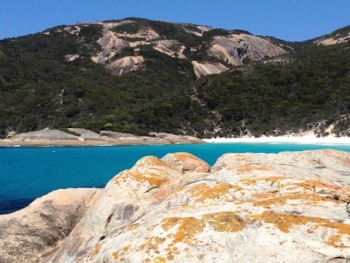 View a map of Two Peoples Bay National Park to get your bearings. 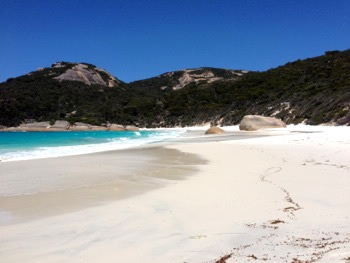 Little Beach is one of the most beautiful beaches on the south-west coast. 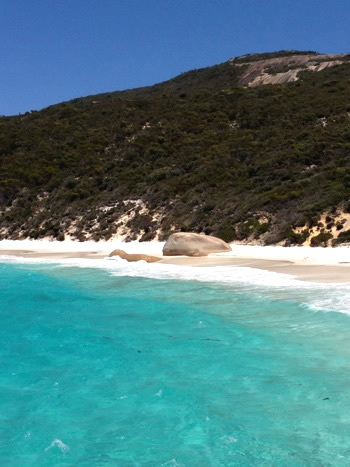 Beautiful turquoise waters, white sand and large waves make Little Beach a must-see for travellers to the region. The stairs or ramp from the car park lead directly on to the northern side of the beach. 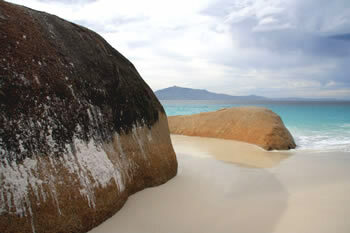 It is a beautiful walk along the beach to where a giant stone stands alone against the sea. 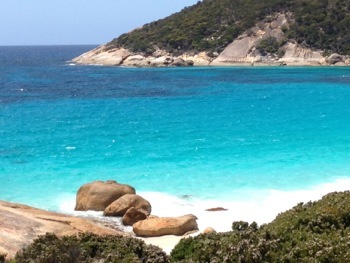 Little Beach is somewhat sheltered by the headland and, as we said, is blessed with bright turquoise waters. 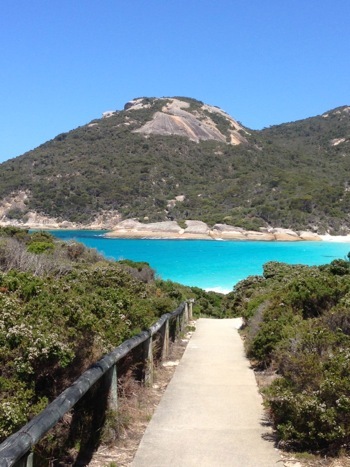 There is a flight of stairs which descends from the car park to the beach at this end. Another path leads around the rocky headland to the north along the Two Peoples Bay Heritage Trail. 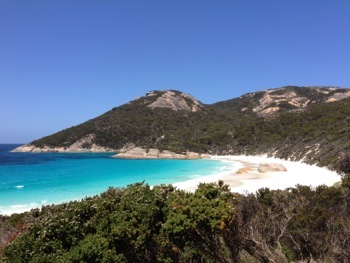 After visiting Little Beach, everyone we met found it to be one of their favourite destinations. Sheltered somewhat inside Two Peoples Bay, and facing north-east, Little Beach offers fantastic views towards Mt Manypeaks and Waychinicup National Park to the north. Heading away from Little Beach along the Two Peoples Bay Heritage Trail gives you spectacular views across the waters to North Point - the northern point of Two People's Bay. 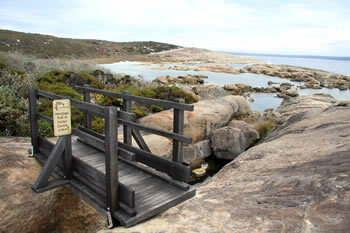 The path winds over four kilometres to the Visitors Centre at Two Peoples Bay. The surrounding countryside is ... difficult to express in words. 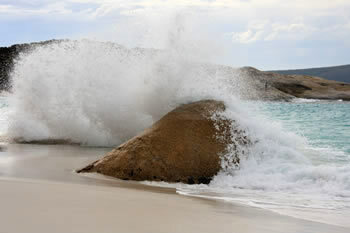 The trees, the rock, the sand, wind and ocean. A breath of clean, fresh air. It is wonderful that we have preserved this place for the future. We found Little Beach and the surrounding coastline an excellent place to show our children examples of 'king' waves. Standing behind the boulder in the middle of the beach the larger than normal waves crash quite dramatically against the rocks. Be careful when near the ocean! Watch the waterline on the sand, not the waves they are deceptive. 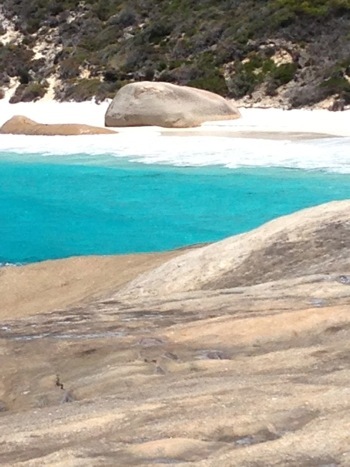 At the far southern side of the beach (above) there is a path over the headland to Waterfall Beach where a waterfall gushes down from the rocks and on to the beach.